TOP > What is Talc? 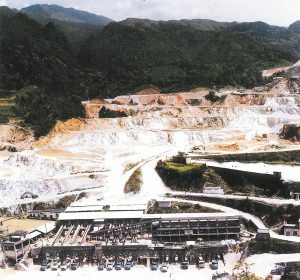 Talc ore is mined in a layered mineral state. Talc ore is white, pink, light green, and gray in color, from which white or gray powder is obtained when it is pulverized. The chemical name of talc is hydrous magnesium silicate (Mg3Si4O10(OH)2). Talc has a true specific gravity of 2.7 and Mohs hardness of 1, which is the softest inorganic mineral with excellent heat resistance and chemical stability. Talc ore is produced in many parts of the world. High purity talc ore with high industrial use value is produced in China, India, and Pakistan.